FQB "Enchanting" Collection is a bold and beautiful (no pun intended) digital kit, perfect for your summer scrapbook layouts and cards. Imagine a party invitation or engagement card...how about a layout of you dressed in your finery and enjoying a special event or remembering someone who you hold dear to your heart?! The creative possibilities are endless....and the finished products will be Enchanting!! 3 Bows flowing and gracious! 1 Frame...you're a star....you need a frame to match! 1 Label adorned with a single flower....will you add writing, a photo or leave it as is to give your layouts and cards the perfect effect?! 3 Squares...now not just a simple square....see if you can find them in the preview! 3 Tags with grommets in the top centre.....you just have use one of these gorgeous tags in your creation! 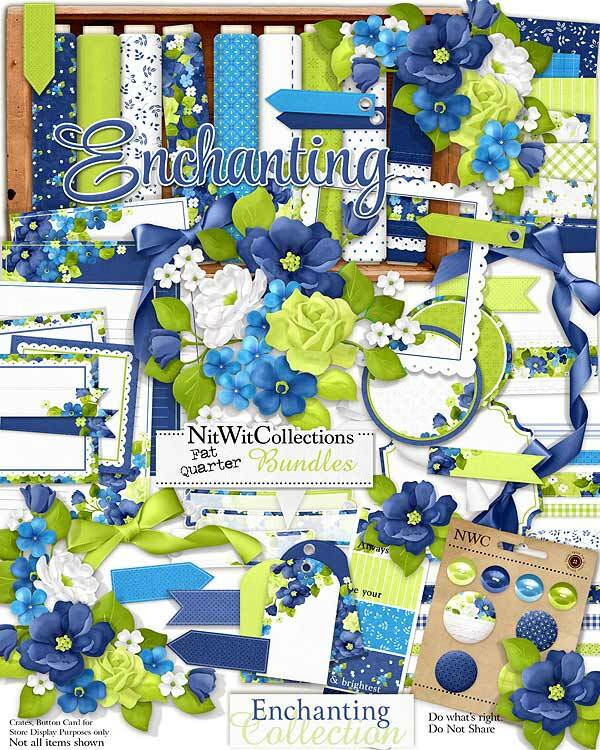 1 Word art - "Enchanting"....now how'd we describe this kit so succinctly?? 6 Word tags - blank, some more intricate and some are more plain...which works best for your vision? ?